The theory of Yin and yang is the basis of the old Chinese philosophy. Yin originally means dark side of the mountain and yang means the sun side. On the body the yang meridians are on the side that is normally in the sun (the back) and the yin meridians are on the shadow side (the front). Yin and yang are manifested everywhere and all movement and changes are in between them. These movements we call ‘life’. We use the words yin and yang to describe this life. Yin and yang are no definitions, but a method to describe changes. A man is more yang than a woman. But a young woman is more yang than an old woman. Yin and yang describe relationships. There is no absolute yang or absolute yin. Yang: heaven, male, energy, light, warm, summer, active, salt. Yin: earth, female, matter, darkness, cold, winter, passive, sweet. The yin organs are: lung, spleen, kidney, heart, liver. The yang organs are: large intestine, stomach, bladder, small intestine and gallbladder. The yin organs are filled with blood. Lung is an exception, but this organ is surrounded with blood. The yin organs are of vital importance for the body. Weakness of the yin organs often leads to death. The yang organs are full of chi. Chi often changes. This means that they are sometimes full and sometimes empty. The yang organs play an important role in digestion. A yang organ can be removed without causing death. 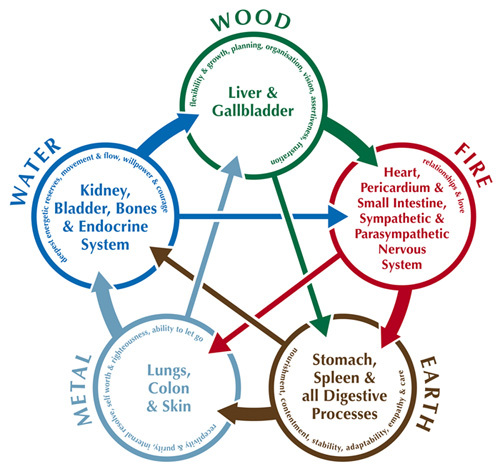 Every yin organ is related to a yang organ with a similarly function.<?p> Lung/large intestine: excretion and inhalation spleen/stomach: storage kidney/bladder: purifying heart/small intestine: quality of the blood liver/gallbladder: distribute energy.